The DC All Access panel at Emerald City Comicon was crashed by none other than Gerard Way, Eisner Award-winning writer of The Umbrella Academy and former vocalist and co-founder of the alternative rock band My Chemical Romance. 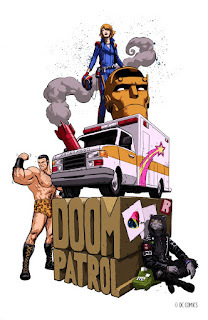 Way announced that he will be curating DC's Young Animal, a new mature reader pop-up imprint of DC Comics that will consist of four series and feature his creative direction. DOOM PATROL – This September, in the spirit of Grant Morrison's legendary run on the series, along with other classic incarnations of the characters, writer Gerard Way and artist Nick Derington will put their unique stamp on the world's strangest heroes taking on the universe's strangest villains. SHADE, THE CHANGING GIRL – An alien takes over the body of a 16-year-old bully and must face the challenges of being a stranger in a foreign land, plus the consequences of a life she didn't live. Star Wars’ Moving Target writer Cecil Castellucci and artist Marley Zarcone explore themes of madness, alienation, and the bizarre in this sci-fi thriller, with covers by Becky Cloonan. The new series hits shelves in October. "I am thrilled to help bring DC’s Young Animal to life, having been raised on experimental 80s and 90s takes on superheroes. I see Young Animal as a place to try new ideas- following the spirit of those books from the past but bring them somewhere else," explains Way. "I see it as an imprint where we can explore fine art, bold concepts, mature themes, and strangeness- with lots of heart." "We’re excited about Gerard’s vision for DC’s Young Animal," explain DC Entertainment Co-Publishers Dan DiDio and Jim Lee. "Giving DC Comics characters different story tones and distinct art styles will result in a different look and feel for the line." Check DCComics.com/YoungAnimal and follow #DCYoungAnimal for updates.